The Skinny: Even Jackie Chan's most loyal fans have been known to break out in hives at the mere mention of Heart of Dragon. Heart of Dragon is a film that tries to be all things to all people. Whether you're into melodrama, comedy or action, this film has something for you. Or not. 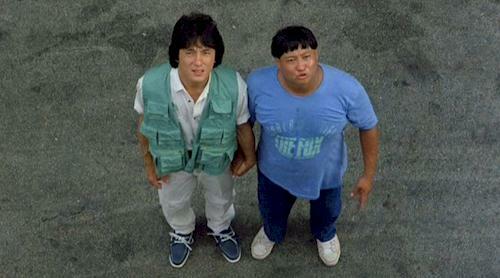 The story involves the mentally challenged Danny (sympathetically played by Sammo Hung) and his brother Tat (Jackie Chan). Tat is a cop who wants to join the merchant marines and sail into the sunset free of the burden of his brother. Tat's whole life has been about taking care of Danny and he resents him for it. Of course, deep down Tat's really a nice guy. Just when you think he's going to desert Danny, he comes to Danny's rescue in a show-stopping action sequence involving stolen diamonds. What the…? Notes:  The Fox DVD includes two fight scenes that were added to the Japanese print, which supposedly features a gag reel at the end of the picture. Sadly, the Fox DVD does not include any outtakes.